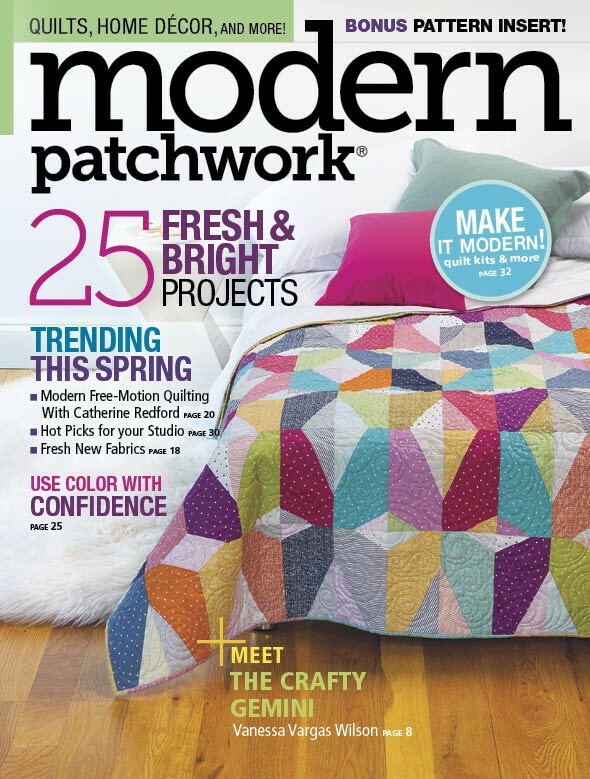 Today's quilt was featured in Modern Patchwork magazine. Designed by Lisa Swenson Ruble, it uses the Color Weave collection from Contempo Studio. 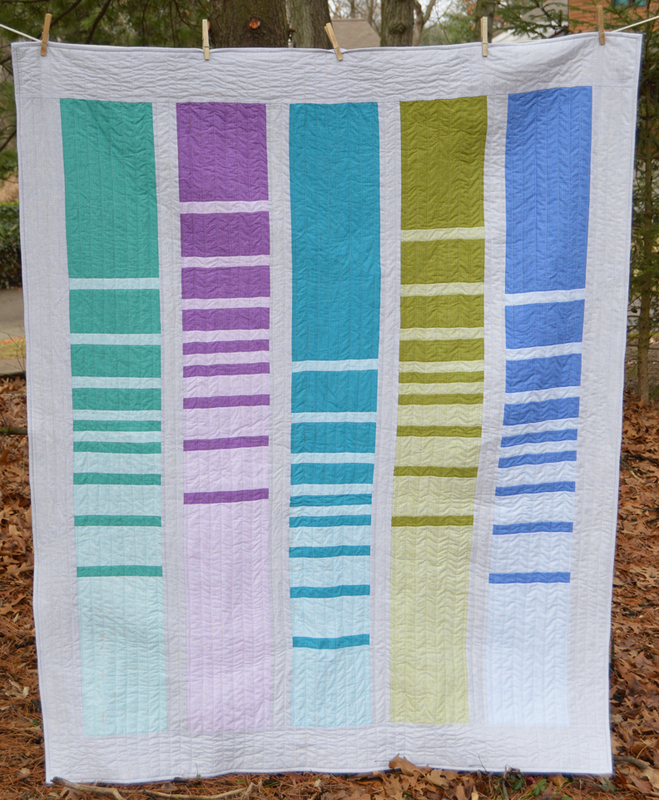 We think the name, "Frequency," perfectly describes the look of the quilt! What attracted you to the Color Weave collection? I loved that each color in the line came in three shades. It seemed perfect for playing with designs that depended on some sort of gradation for the pattern. The pattern in the fabric is a subtle crosshatch--enough to create interest and texture up close, but also have the illusion of a solid from a distance. I had designed the table runner below for Benartex's Fat Quarterly newsletter. I started out by trying to expand that design into a full quilt, but it wasn't working. I started experimenting with other ways of playing the shades of color of each other and ended up with this design. Why do the Color Weave fabrics work so well in this design? The variety of shading! Having three coordinating shades--light, medium and dark--of each color gave me plenty of options to work with. Ultimately I only used the light and dark shades of the colors because it created the most contrast. How did you choose which colors to use? It was hard to choose! I love the palette of Color Weave--it's not your traditional red, blue, green, etc., but rather a more modern version of each color. I tried several color combinations in the design but ultimately stuck with cool colors, which tend to be my favorite anyway. I straight line quilted this quilt on my home machine. 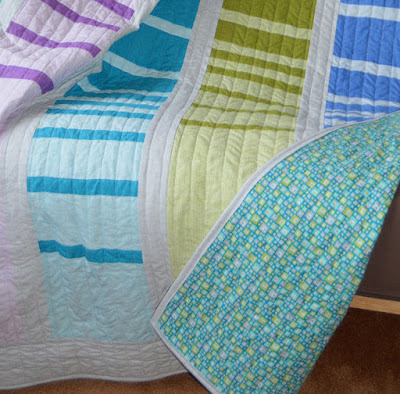 I think it adds texture without taking away from the impact of the design, and it enhance the modern appeal of the quilt. Tell us about the backing. I chose a backing fabric from Cherry Guidry's Soul Blossom collection. I loved the little squares, and it was like this fabric was designed for the colors I chose for my quilt--they are all represented on the back! A total coincidence, but fun. I like how each vertical row is spaced differently. I think it really adds to the design, and it was fun to experiment with how changing the appearance of each row changed how the quilt looked. Click here to see the entire Color Weave collection. Click here to learn more about our Fat Quarterly newsletter. Click here to learn more about Lisa Swenson Ruble's work. 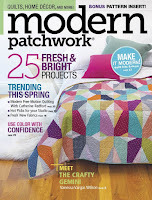 Click here to find Modern Patchwork magazine. 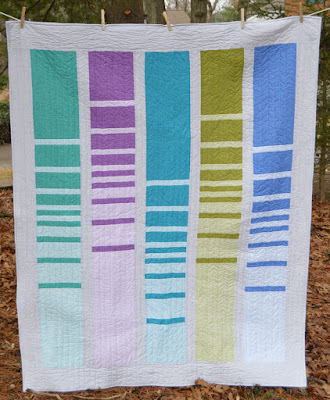 I really like this quilt and the way each vertical row is different from the others. It is so restful.